Tom Johnstone scores against Catalans. It was quite the season for Wakefield Trintiy's Tom Johnstone. After recovering from an anterior cruciate ligament injury in 2017, the 23-year-old returned to action in some style last campaign. 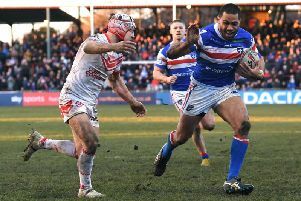 He scored 24 tries in 23 Super League games for Wakefield as Chris Chester's side secured a second-consecutive fifth-placed finish. Only Man of Steel Ben Barba scored more with 28. Johnstone capped a fine year with Trinity by earning his first England cap in a friendly with France. The prolific winger went on to score a first-half hat-trick as England beat France 44-6 in Leigh.